This article is about the plant genus. For the bird genus, see Linaria (bird). For the Sporadic town, see Skyros. Linaria is a genus of 150 species of flowering plants, one of several related groups commonly called toadflax. They are annuals and herbaceous perennials, and the largest genus in the Antirrhineae tribe of the plantain family Plantaginaceae. Linaria was traditionally placed in the family Scrophulariaceae. Phylogenetic analysis has now placed it in the vastly expanded family Plantaginaceae. Closely related genera include the Nuttallanthus (American toadflaxes, recently split from Linaria), Antirrhinum (snapdragons) and Cymbalaria (ivy-leaved toadflaxes). 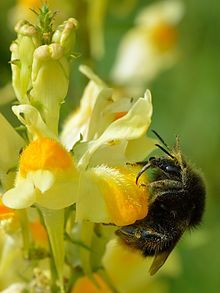 Several Linaria species are cultivated as garden plants, notably L. alpina (alpine toadflax), L. maroccana (Moroccan toadflax), L. purpurea (purple toadflax) and L. vulgaris (common toadflax). Common toadflax or butter-and-eggs (Linaria vulgaris), a European species which is widely introduced elsewhere and grows as a common weed in some areas. Broomleaf toadflax or Dalmatian toadflax (Linaria genistifolia, syn. L. dalmatica), a native of southeast Europe that has become a weed in parts of North America. Purple toadflax (Linaria purpurea), a species native to the Mediterranean region grown as a garden plant for its dark purple or pink flowers. Pale toadflax (Linaria repens), a species from western Europe similar to L. purpurea, but with paler flowers. The members of this genus are known in English as toadflax, a name shared with several related genera. The scientific name Linaria means "resembling linum" (flax), which the foliage of some species superficially resembles. The genus is native to temperate regions of Europe, northern Africa and Asia, with the highest species diversity in the Mediterranean region. Some Linaria are regarded as noxious weeds. They are likely toxic to livestock, but ruminants generally avoid them. Toadflaxes are used as food plants by the larvae of some Lepidoptera species, including the mouse moth (Amphipyra tragopoginis) and the common buckeye (Junonia coenia). L. vulgaris has been used as a medicinal herb for the treatment of many illnesses and conditions, including cancer, hepatitis, hemorrhoids, scrofula, and scurvy. It has been used as an astringent, an emollient and a laxative. ^ Brickell, Christopher, ed. (2008). The Royal Horticultural Society A-Z Encyclopedia of Garden Plants. United Kingdom: Dorling Kindersley. p. 636. ISBN 9781405332965. ^ Dalmatian Toadflax (Linaria dalmatica). National Invasive Species Information Center, United States National Agricultural Library. ^ Sing, S. E. and R. K. Peterson. (2011). Assessing environmental risks for established invasive weeds: Dalmatian (Linaria dalmatica) and yellow (L. vulgaris) toadflax in North America. International Journal of Environmental Research and Public Health 8(7) 2828-53. ^ Duke, J. A. Ethnobotanical uses: Linaria vulgaris. Dr. Duke's Phytochemical and Ethnobotanical Databases. Wikimedia Commons has media related to Linaria. Vargas P, JA Rosselló, R Oyama, J Güemes. 2004 Molecular evidence for naturalness of genera in the tribe Antirrhineae (Scrophulariaceae) and three independent evolutionary lineages from the New World and the Old. Plant Systematics and Evolution 249:151–172. This page was last edited on 6 March 2019, at 04:47 (UTC).